Inside method if we have some statements which may proven to raise exceptions we need to keep those statements in side try catch blocks in order to handle the exceptions. There is a situation where a method will have a return type and we can return some value at any part of the method based on the conditions. So mixing these two scenarios we may have a situation to return some value from try block or catch block in such cases we need to follow some basic rules. This is also one of the famous interview question "can we write return statement in try block ", "can we write return statement in catch block ", "what will happen if we return some value in try block or catch block ", "will catch block execute after return statement " and "what are the basic rules we need to follow when we are returning or our method returning some value in try or catch blocks"
We will see the all the scenarios and conclusion. 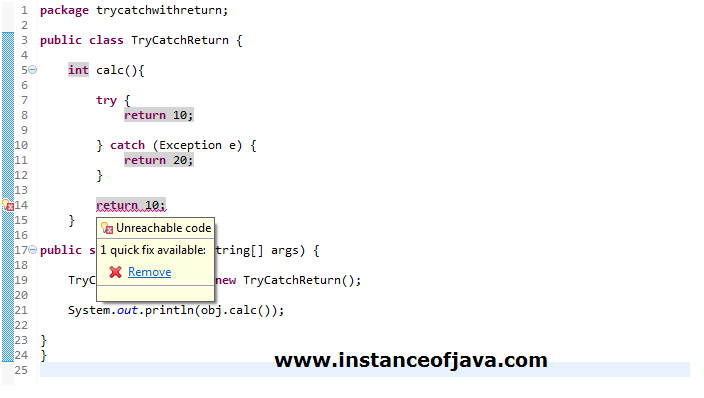 Even though it in this condition it wont reach end of the method still it asks us for return at end of the method because in some cases there may be a chance of getting exception in try block so it will not completely execute try in this case we don not have return in catch so at end of the method it expects some value to be return because the method have some return type. 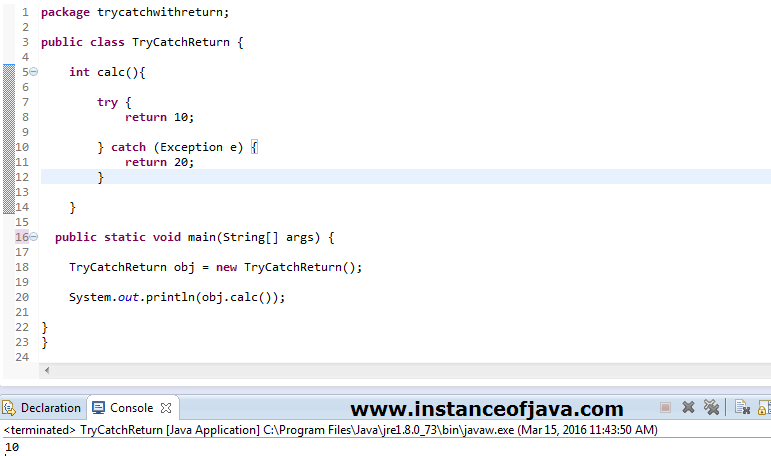 in the above program last statement will not execute at any condition so it became unreachable code as we know java does not supports unreachable codes so it will raise compile time error.